We will be featuring some rare vintage travel posters dating back to the period between the 1940's and 1980's. Most of them are stunning examples of beautiful graphic design. This poster will be up for auction at "rare and important travel posters" auction at Swann Auction Galleries in New York City on November 18th. Part of the Eastern Alps, the Dolomites are located in Northern Italy. Characterized by jagged peaks and vertical rock walls, the mountain range attracts hikers and skiers from around the world. An art student in Vienna, Lenhart did further study in Florence before settling in Merano, where he lived for the rest of his life. 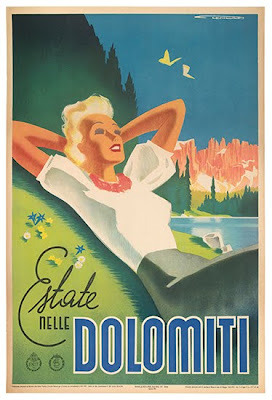 A painter, portraitist and illustrator, Lenhart also designed over seventy posters, many of which were for the Dolomites. Lenahrt 1.